Buoyed by successful attempt to attract only the most discerning of smokers, The Chancellor Tobacco Company (UK) Limited has used the knowledge gained from our presence in widely differing consumer environments to develop and produce yet another outstanding cigarette- an eminently suitable partner for "Treasurer London". 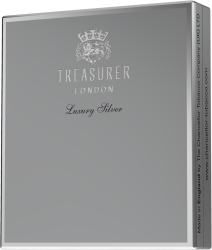 Given that its proposition – "Pure Luxury from the House of Treasurer London" – delivers top quality and status credentials at a more affordable price․ Luxury cigarettes are slightly longer than the King Size cigarettes, thereby offering a lighter, milder smoking experience preferred by many of today’s smokers. 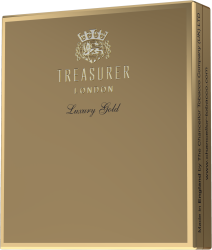 The 90mm luxury length cigarettes are made from similar high quality pure Virginia tobaccos as those used in the traditional "Treasurer London" blend. 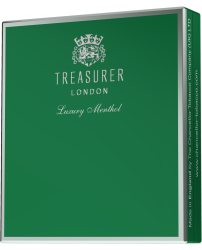 The appearance of the cigarettes, their filter tips with hot foil-stamped "Treasurer London" logo, reflects the sheer quality and refinement that one associates with the "Treasurer London" brand. 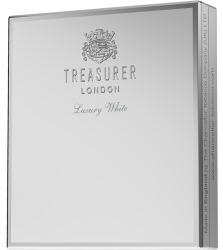 Stylishly packaged in an embossed, hot foiled domed cardboard shoulder box of 20’s with simple but contemporary “Treasurer London” branding, symbolizes the purity of Luxury cigarettes without the need for a more elaborate description. This surely epitomises the rationale behind this exciting cigarette targeted at the more discerning smoker seeking real prestige and style. "Treasurer London" Luxury range is packed in eye-catching 5 x 20’s display cartons in a master case of 5000 cigarettes. Site limited to eligible smokers 21 years of age or older.